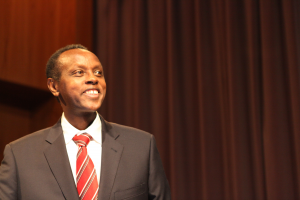 Joseph Sebarenzi, former President of the Parliament of Rwanda and national public speaker, discussed measures taken to ensure justice after the genocide in Rwanda at a BYU French department lecture. PROVO, Utah (Nov. 19, 2014)—When legal action can only go so far to ensure justice in Rwanda after the genocide of 1994, how does a nation promote lasting peace in the face of a tragedy that still haunts them 20 years later? Joseph Sebarenzi, former President of the Parliament of Rwanda and a survivor of the genocide, addressed the importance of empathy, reconciliation and faith when justice cannot completely resolve national conflict. 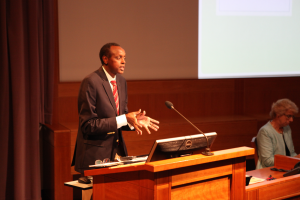 Sebarenzi began by explaining the magnitude of lives claimed during the genocide. He said that it was difficult to determine the number of victims because the government had no reliable statistics. But, according to Human Rights Watch, the closest estimate was between 500,000 and 800,000 Tutsis and a considerable number of Hutus killed from April to July 1994. Sebarenzi said that in the wake of this tragedy, possible solutions for confronting the genocide were narrowed down to two philosophies: restorative justice and punitive justice. The latter form of justice demands that the individual who committed the crime be punished in proportion to the crime committed. The former proposes to not simply punish just to punish, but to use punishment as a means to prevent crime in the future. Sebarenzi said that Rwanda tried to use both. He also identified four different court systems that the Rwandan government used to take legal action against the Hutus implicated in the genocide. One was to establish multiple “gacacas,” a traditional community court system that was used to solve problems between family and neighbors. Although over 12,000 tribunals took place under this system, many of the judges were ordinary citizens without any background in law. Despite the objective to promote justice and reconciliation, Sebarenzi explained that the justice systems were flawed, too slow and often times corrupted by judges under political influence. Massive arrests, public killings and other actions have been taken over the years to establish justice after the genocide in Rwanda, but it has done little to ensure peace and prevent the possibility of another genocide in the future. Sebarenzi reasoned that loving one’s neighbors, even people who committed crimes against them, helps people to grow in their faith and establish the empathy necessary for reconciliation. He believes this is something that everyone is capable of, as well as something that is necessary to promote peace and prevent future tragedies, like the genocide in Rwanda. “Justice doesn’t solve all problems,” he concluded. “You must develop faith, empathy, and a sense of pragmatism. For more information on Joseph Sebarenzi and his work, visit his facebook page or contact Chantal Thompson. PROVO, Utah (Nov. 19, 2014)—The power to forgive is an art difficult to master. But Joseph Sebarenzi, former president of Rwanda’s Parliament, has dedicated his life to mastering it. 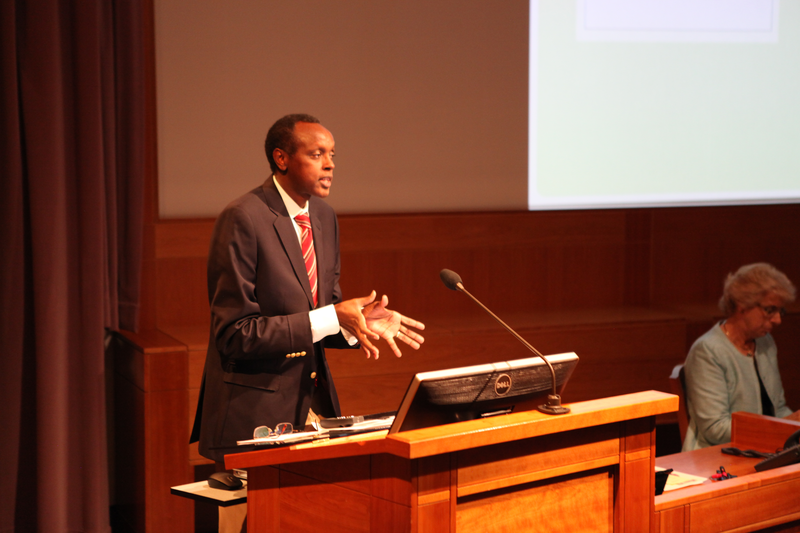 In his lecture, titled “Peace and Reconciliation in Post-Genocide Rwanda,” Sebarenzi described his efforts. Growing up as a Tutsi in a Hutu-controlled Rwanda, hardship and tragedy filled the walls of his village. In one instance, his family hid in an Hutu friend’s home and Hutu rebels came to the door and said, “We know you have Tutsi in there. You are going to die today.” Sebarenzi narrowly escaped death multiple times until he fled Rwanda in 1994. During that summer of 1994, he discovered that his parents and seven of his siblings were murdered in the genocide. In Sebarenzi’s words, “It was a catastrophe beyond understanding.” After hearing the news about his family, Sebarenzi came to a crossroads. He could either “feed the evil that’s inside all of us” or he could feed the good. He chose the latter and decided to make it his mission to help other people do the same. Sebarenzi set three priorities beforehand that dictated his actions that day: peace for future generations, personal faith and emotional and physical well-being. Getting even with people is not going to achieve or promote peace for the future and is not in harmony with his faith, which teaches forgiveness and reconciliation – not revenge and retaliation. In addition, Sebarezi recognized that holding on to anger isn’t healthy. Mercy is something that everyone can work on; it is something that aids in the process of reconciliation, which Sebarenzi attributes to saving his life.